Hippity-hop to the salad stop. You’ll find sweet pear bunnies dressed in their finest! Place 1 lettuce leaf on each salad plate. Place 1 pear half, cut side down, on each lettuce leaf. 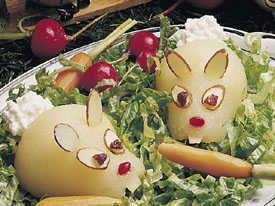 Arrange 2 raisins for eyes, 1 candy for nose and 2 almonds for ears on narrow end of each pear half to make rabbit face. Place 2 tablespoons cottage cheese at opposite end of each pear half for tail. Substitution: No cottage cheese? A regular-size marshmallow that’s cut in half looks just like a bunny’s tail.